NETWORK FINALS: There were no changes from the Friday preliminary ratings. CABLE HIGHLIGHTS: On a holiday weekend night with limited original programming, ESPN’s late Lakers vs. Golden State NBA game won the night at 0.90, with the earlier Clippers vs. Houston game considerably lower at 0.55. On Discovery, GOLD RUSH ticked up to 0.70, and a lead-out TESLA’S DEATH RAY special was at 0.38. Adult Swim’s late-night TENDER TOUCHES was at 0.37/0.31. On Food Network, DINERS, DRIVE-INS & DIVES jumped 0.11 to 0.32, and lead-out GRILL DADS was at 0.25. 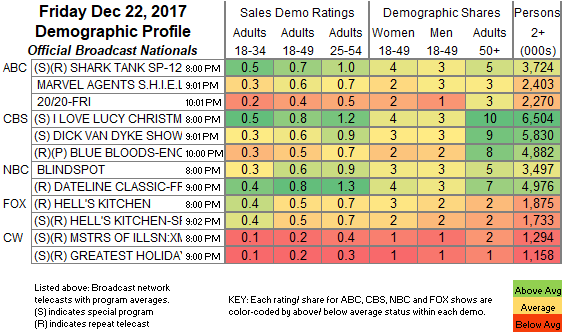 On Bravo, MARRIED TO MEDICINE dropped 0.03 to 0.30. 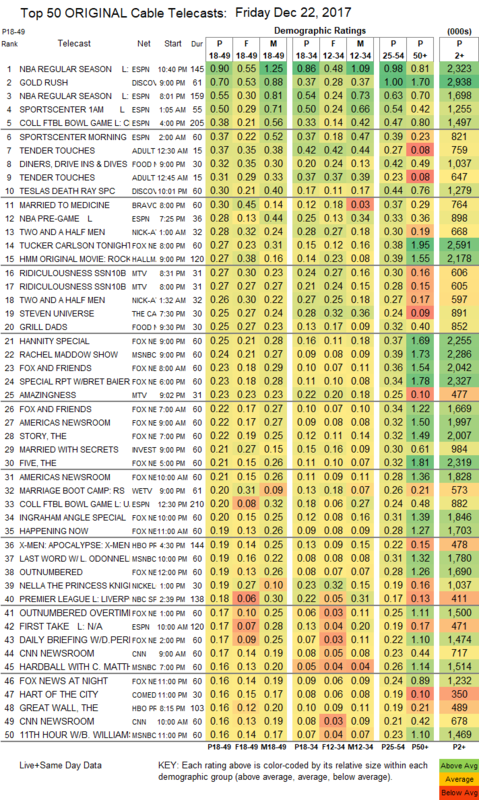 On MTV, RIDICULOUSNESS was at 0.27/0.27, compared to last week’s 0.25, and AMAZINGNESS was up 0.03 to 0.23. Cartoon Network’s STEVEN UNIVERSE was steady at 0.25. ID’s MARRIED WITH SECRETS was at 0.21. WE’s MARRIAGE BOOT CAMP rose 0.07 to 0.20. On Lifetime, BRING IT fell a tenth to 0.16, and THE RAP GAME collapsed by 0.14 to 0.13.